Following a March 11 meeting he and leaders of his Corrections Division already have scheduled, Sarasota County Sheriff Tom Knight will provide county staff information about potential options for moving out of the jail people who are being treated for alcohol and drug addiction, as well as mental health issues. That was the commitment Knight made to the County Commission on Feb. 26 near the conclusion of a nearly two-hour-long workshop regarding the overpopulation of the jail. As of that day, Knight said, 130 inmates would be eligible for such relocation. 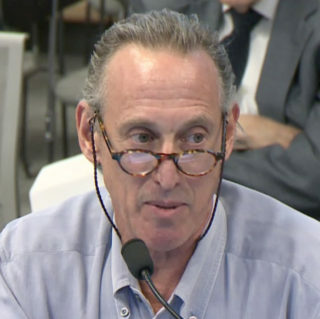 Knight again indicated reluctance for the commission to spend an estimated $120 million to $130 million on a new detention center, reprising remarks he has made over the past year about finding alternatives to such an undertaking. The March 11 session, Knight added, is planned with representatives of the Gulf Coast Community Foundation and First Step of Sarasota, the latter of which provides programs to help individuals overcome addictions. In the meantime, Knight pointed out, Wayne Applebee, the county’s senior manager of health and human services, has significant expertise in criminal justice issues. Maj. Brian Meinberg, who heads up the Sheriff’s Office Courts and Corrections Division, could work with Applebee to begin laying the groundwork in the event the commissioners decide in the not-too-distant future to build an addiction recovery facility in lieu of a new jail, Knight pointed out. In fact, Knight said, it might be possible for county staff to find a building that could be remodeled for such a purpose. Many inmates need treatment for addiction, Knight continued. Yet, he does not have the authority, Knight stressed, to get them into specialty programs that would help them. “How do we get these people out of a hardened cell and into recovery which isn’t cheap,” he added, noting that it nonetheless is much less expensive than a $120-million jail. Commissioner Nancy Detert pointed out that the community used to have “10 different places you could go if you had substance abuse problems,” but the only one she is aware of at this point is First Step. She asked that Applebee work on a list of programs the county could utilize for treatment of people instead of sending addicts to jail. Along with Knight, the commissioners had invited to the Feb. 26 workshop State Attorney Ed Brodsky, Public Defender Larry Eger and Court Administrator Walt Smith, all with the 12th Judicial Circuit Court, which serves Sarasota, Manatee and DeSoto counties. Knight also proposed that he and members of his staff hold a private meeting with Brodsky, Eger and Smith to try to determine about how best to handle some of the situations that are keeping the jail inmate count high. Their decisions should factor into what the board ultimately needs to do, Knight indicated. Although the three wings of the jail were designed to accommodate 1,075 beds, Applebee pointed out during his opening remarks on Feb. 26, their operational capacity, based on industry standards, is 836. Knight has explained that his staff must keep juvenile offenders completely separate from adults, men separate from women and violent offenders isolated in the jail population, among other requirements. 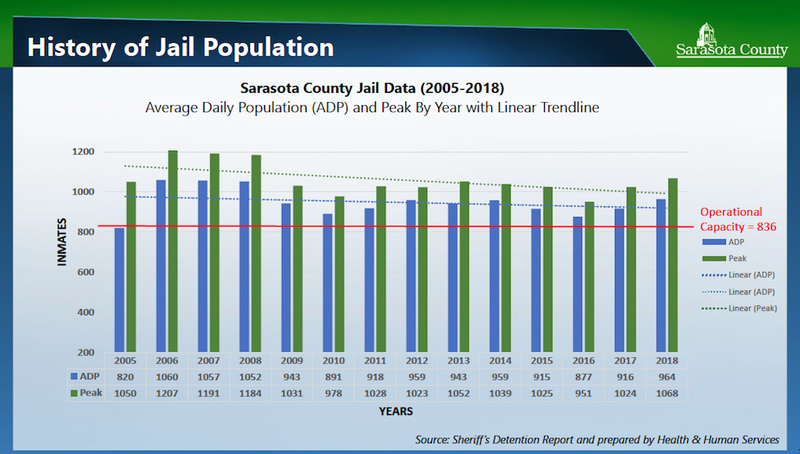 Records since 2005 show the highest average daily population of the jail was 1,060, in 2006, according to a graphic Applebee presented on Feb. 26. The number was 1,057 in 2007; 1,052, in 2008. In 2018, the graphic showed, the figure was 964. Oh the morning of Feb. 26, Knight told the commissioners, the count was 883. Commissioner Michael Moran voiced worry that holding off on a decision about constructing a new jail could lead to an emergency situation with population overflow. 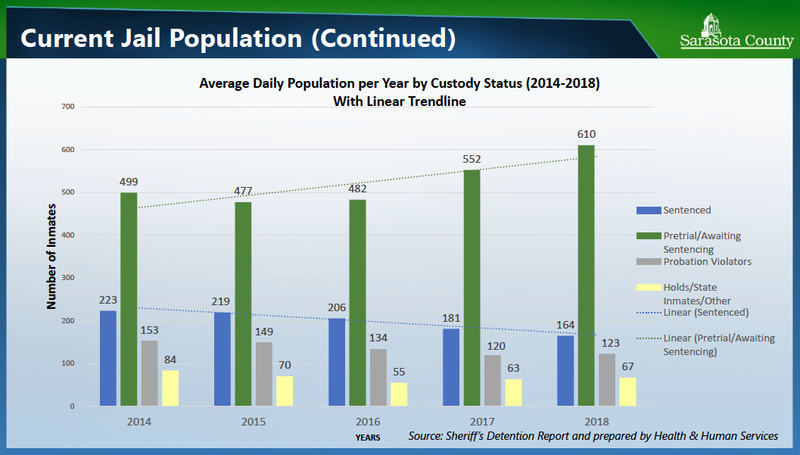 Moran asked County Administrator Jonathan Lewis to compile data about trends in the inmate count in correlation with county population projections, to assist the commission with the decisions it will have to make. Further, Moran asked for an analysis of the maintenance expenses the county is incurring at the jail — including the West Wing, which was built in 1975 — and projections for spending as the facilities continue to age. If the commission were forced to construct a new facility at such a high expense, he continued, it also would have to eliminate other priorities it has set. “Obviously, public health and safety is our No. 1 priority,” Hines said. Still, Hines noted, crime continues to fall in the county. In the 10 years he has been sheriff, Knight pointed out, crime is down 51% in the county; violent crime has fallen 43%. 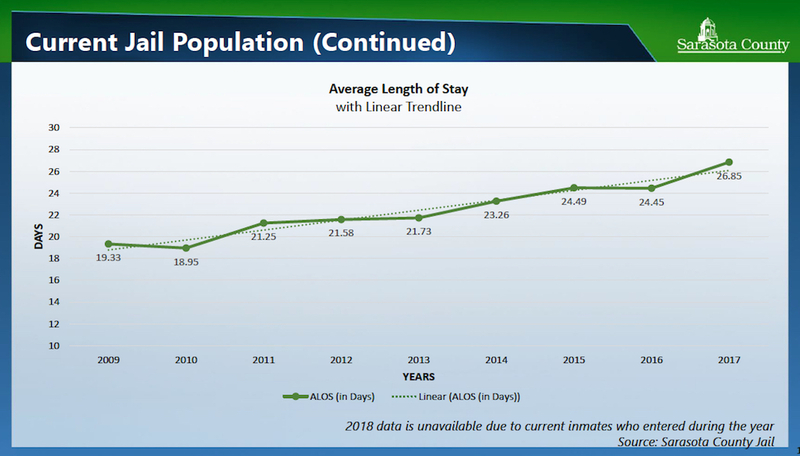 Another graph showed the average length of stay in the jail was up 39% from 2009 to 2017 — from 19.33 days in 2009 to 26.85 days in 2017. That data covered all inmates, Applebee said, regardless of how much or how little time any single person was confined to the facility. Hines asked Court Administrator Smith if he could explain why so many more people are in jail awaiting sentencing. Brodsky responded that the current county population is about 419,000. The Bureau of Economic and Business Research (BEBR) at the University of Florida has projected that the number will rise to 426,300 by 2020; 475,900 by 2030; and, in 2040, 509,000 people living in Sarasota County,” Brodsky continued. 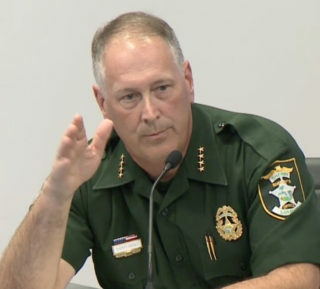 “You have three felony judges in Sarasota County to handle 419,000 folks, to handle all of the work that the [Sheriff’s Office] is generating,” he said, along with all the arrests made by the municipal police departments and the Florida Highway Patrol. Yet, clearance rate data for the 2016-17 fiscal year — which, Brodsky explained, is a measure of the responsiveness to the demand for judicial services — was 104% in Sarasota County, “which is outstanding … I think that that burden, that pressure, is being felt by the judges,” as well as his and Eger’s staff members. Annually, he said, the judges handle about 3,000 felony cases, along with a multitude of other types of hearings — from appeals of misdemeanor decisions in County Court to bond hearings to motions to suppress evidence. In the past fiscal year, he continued, the 12th Judicial Circuit had 124 jury trials. Yet, Eger pointed to the jail population trends graphic that Applebee had shown the board earlier. In 2017, the average number of pretrial inmates in the jail per day was 552, compared to 181 who had been sentenced and 120 with probation violations. In 2018, the pretrial figure rose to 610, compared to 164 sentenced and 123 probation violators. Judges do set bonds, Eger continued, but many people cannot pay the bonds. “Forty percent of the American public cannot afford a $400 car repair,” he said. Yet, even when a monetary bond has been set — indicating a person is not a flight risk or a danger to the public, Eger stressed — “Courts might feel they’re being generous” by setting a $500 bond in a driving with a suspended license case, for example. When Hines asked who has the power to make the decision on the bond amounts, Eger told him the judge in the case has the ultimate responsibility. “But public safety is the mostimportant thing that you as a County Commission have the responsibility for,” Brodsky stressed. “I really do think … you’re going to see those numbers drop back down,” he added, referring to the jail population, as a result of that court’s operation. 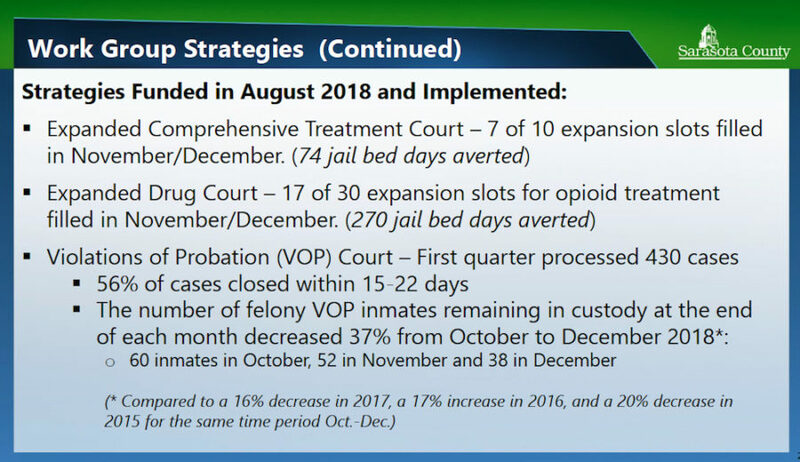 In the first quarter of the fiscal year, data shows that 430 cases were processed through the Violation of Probation (VOP) Court. Of those, 56% were closed within 15 to 22 days, Applebee told the commissioners. 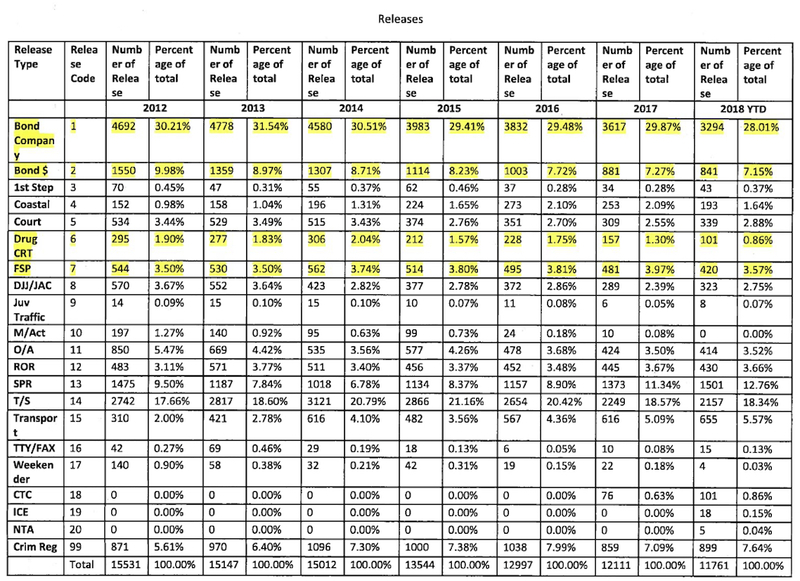 The number of felony VOP inmates remaining in custody at the end of each month decreased 37% from October to December 2018, he added.